Last Friday evening, almost a thousand low income and at risk children from schools in the San Juan Unified School District came to New Life Church to celebrate the beginning of a new school year at the 8th annual event called First Day. First Day was started by an organization called AboutKidz and honors and celebrates kids in our community by providing things they need to start the year out well. 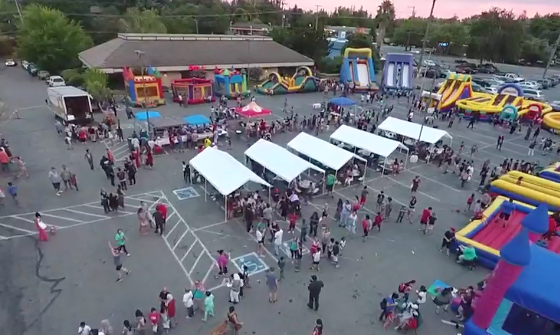 Kids come with their families to a block party in the church parking lot complete with 15 bounce houses, entertainers, a BBQ and other festival like activities. Kids then come inside the church to pick our their own backpack full of all the supplies they need to have a successful year. Kids also get free haircuts from licensed professionals, a complete school outfit and a brand new pair of shoes. They leave the party with a bag of groceries for their family. THANK YOU AboutKidz, and all the community organizations, businesses and donors who work so hard each year to provide kids with the confidence and enthusiasm to start school well!